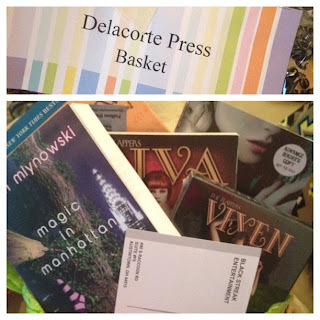 SHORTIE SAYS...: YA Fest + Giveaway! Hey all so yesterday in Easton, PA was something called YA FEST! And let me tell you it was awesome! Not only did I get to meet my favorite author (who I've been dying to meet!) but I got to meet other amazing authors, bloggers, and even enter raffles as well! I loved the way it was set up. It was kind of like a non-congested free roam. You could talk to authors, take pictures, have them sign things. Plus they had SO many goodie baskets and treats! I had a lot of fun... even though driving home in a down pour was interesting... I cannot wait for next year! 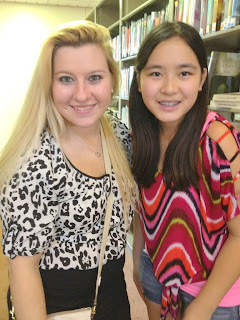 There were two bloggers I met for the first time and I was so glad I met them! First was Vivian from Confessions of a Vi3tBabe or you may know her as the awesome girl who runs Deity Island! 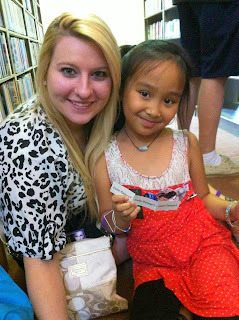 She also brought along her daughter Alyssa who I definitely loved just as much as her mother :). The next blogger that was told SHE HAD TO FIND me (by I don't know... some really awesome blogger who I luv so gosh darn much whose name just may be JESSIRAE) is Eileen from Singing and Reading in The Rain! I really hadn't talked much to Eileen before YA Fest, but she is such a sweet heart and I'll definitely be stalking her in the future :). SO NEXT.... I'm going to basically GUSH on how I finally got to meet Jennifer L. Armentrout in real life. :) Ever since I found out she was going to be at YA Fest, I've been literally counting down the days! She happened to be sitting at the very first table with none other than the lovely Marie V. Synder... so I basically bee-lined for them. If you've been on JLA's live chats... she's honestly the same awesome, funny, down-to-earth person. And, of course she had her lollipop ;). Viv, myself, and eventually Eileen basically hung at her table the entire day and it was so awesome. Seriously a dream come true. Couldn't have asked for a better day. Plus she offered to help me carry my things out to my car... IN THE RAIN. Basically best author EVER. So thank you Jennifer for an awesome day and I cannot wait to see you again at the end of August!! And so now, I'm going to pic spam you :). Myself & Jennifer :) ....lollipop. Another Candid by Vivian - Not sure what we were talking about here... but it looks intense HAHA. Another author that I finally got to meet was Amalie Howard! The girls from Good Choice Reading and Kristi Cook always go out with her and she's always in the area and I've never got to meet her! But, Amalie is awesome! She's another down-to-earth yet funny author. Was so happy I finally got to meet her! Amalie and I :) - Another shot I love! Amalie, Jen, and I - take 1 ! Amalie, Jen, and I - Take 2 ! Michelle Zink, Jon Skovron, and Anne Greenwood Brown! Now the awesome gift baskets I won from YA Fest - Thank you to the hosts, authors, and publishers for these!! 1) One winner will win signed copies of Half-Blood and Pure + Swag. 2) One winner will win a signed copy of Obsidian + Swag. 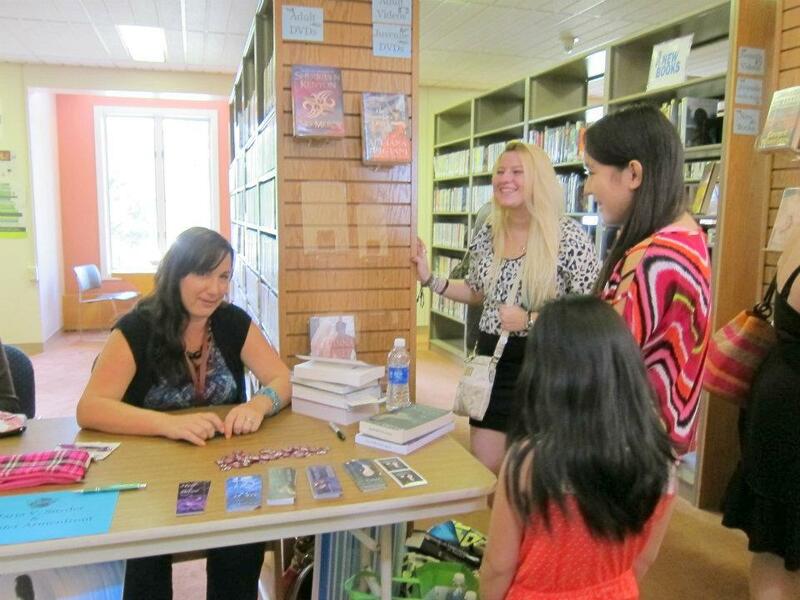 Jennifer Armentrout is so freaking amazing. I love her books. I wanna meet her!!! I also love pictures, so of course, I enjoyed your blog post! You got to meet JLA!! Lucky! You're so lucky!!! 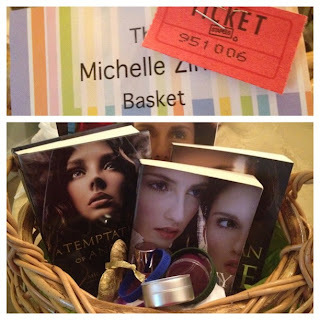 The basket looks so pretty! ooh!! JLA!!! the event sounds amazing! lucky! I wish I was in the event. :< Looks like it's packed with fun!! It was SO awesome meeting you, can't wait for PAYA! JLA is my favorite author. Ever. I mean, she created DAEMON BLACK for the love of baby aliens everywhere!! I'm jealous you got to meet her, but since you're giving away JLA stuff, I am somewhat less jealous ;)Thanks for the awesome giveaway! JLA is such a sweetheart!!!! I'm pretty sure she was my first twitter follower. I just adore how much she loves her fans. It's absolutely fabulous! I love JLA because she completely took me by surprise! I hadn't heard of her before someone recommended Half-Blood to me since I love mythology so much and ever since I have been in LOOOOOVE with her writing! She can also creat some pretty hot guys... I mean AIDEN?! It doesn't get better than him! Ahh!! So lucky you got to meet JLA! She's such a good writer and I love the characters she comes up with!! I just love JLA and her books! I can't help but red every book that she writes because they're so darn good! Thanks for the giveaway! Wow, I wish I can meet JLA in person. Hopefully she will come close to where I live, so I can go to one of her signs or tours. I loved how for the caption for the first picture of you and Jennifer you did the ...lollipop. :D I think she's an awesome author. Thanks for the giveaway! The YA Fest looked amazing, I wish I lived in America so I could attend all these wonderfully bookish events!! I really love Jennifer Armentrout and her books because her characters are so charming and likable. I especially love Seth, with his all his snarkiness! I love that everyone is there because of their love of reading & books YA or otherwise. I just love seeing so many people out there showing their love of books - I don't care what genre it is, reading is important, and sometimes we forget to show how important it is. It looks like so much fun! And you finally met your idol/rockstar Jennifer!!! Woohoo, lucky you :) Now I want to meet her LOL and have my book signed! 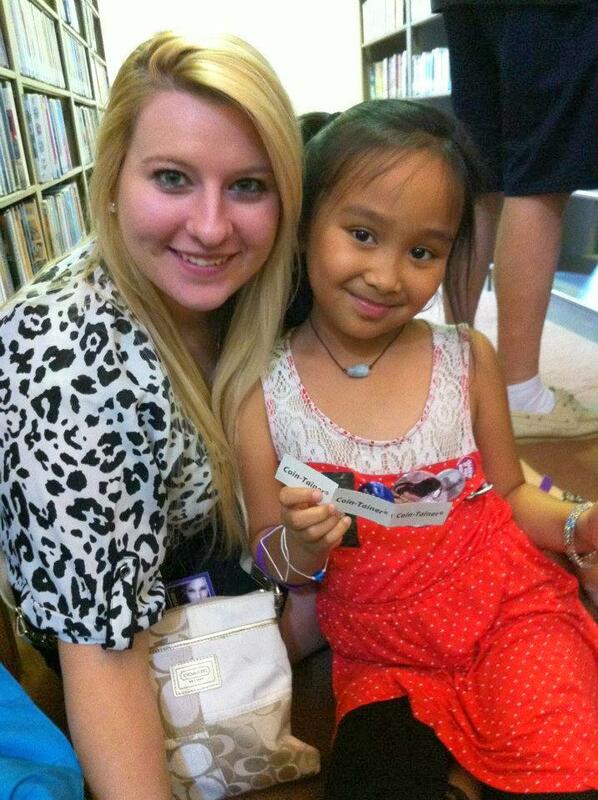 I love Jennifer because not only her books are awesome but because she's the nices person to her fans! 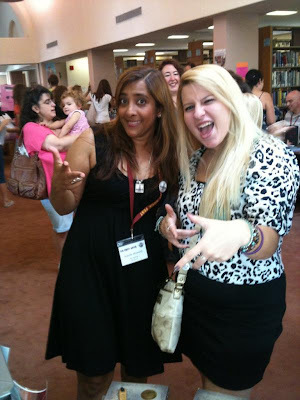 What I liked about your YA fest? How about freaking everything?? :D I All those authors, Jennifer, Maria and Brigid! I wished I could have gone!! JLA is awesome. i am dying to read onyx. i wish she would come to my town but it hasn't happened yet. It looks like it was such a fun event. I love the pictures. I like or should I say I am JEALY that you got to take a pic with my favorite author on this planet!!! It looks like you had so much fun and I wish I was there! 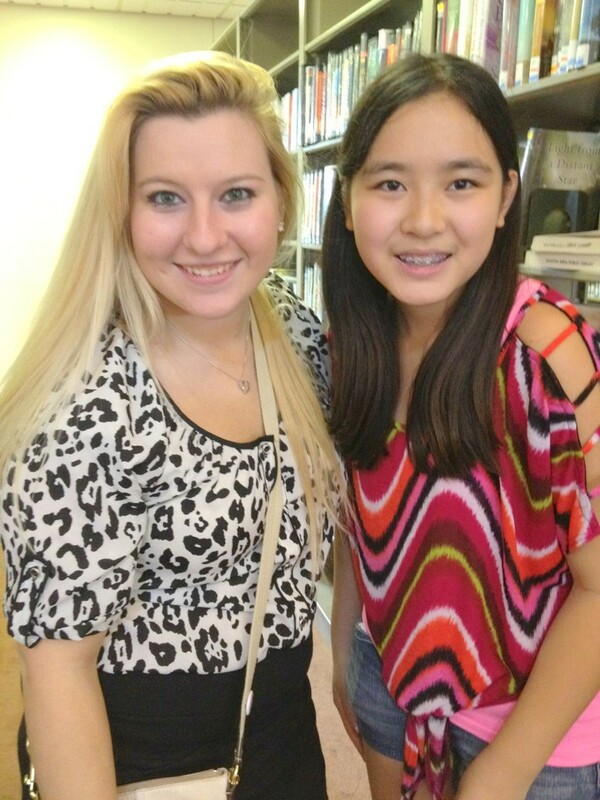 OMGGGGG your so lucky you got to meet the authors! I'm jelly! 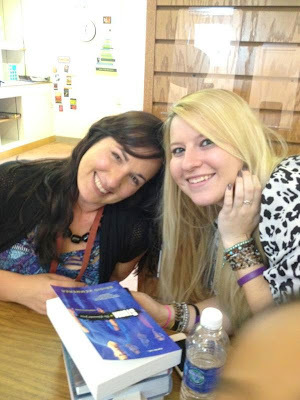 First of all, im totes jealous you got to meet THE Jennifer L. Armentrout! I wish she can tour on the West coast someday =]. Second, I really love all the pictures! 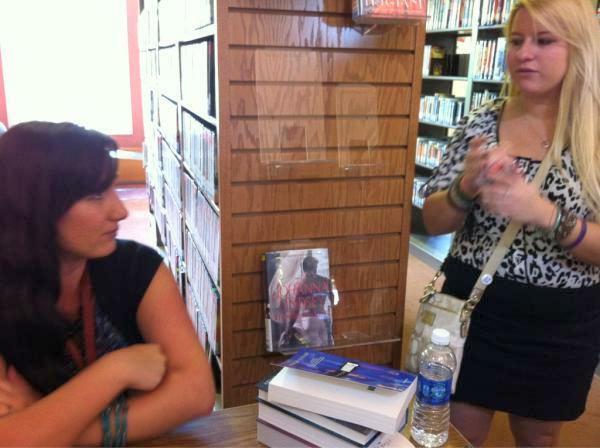 I like to read about book signings and pictures are always nice to look at. I love JLA because her characters resonate within me long after I've read one of her books. Plus, she's crazy good with describing what's happening. You're so lucky to have gotten the chance to meet her! Thanks for the giveaway! I love all the pictures in your post!! Also love how JLA writes amazing books and is so sweet! 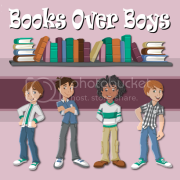 I love her books simply because they're AWESOME!! !